The White stork (Ciconia ciconia) nest in Europe, northern Africa and western Asia. In Estonia, there are plenty of nesting storks. As you already know: babies are being brought by storks. 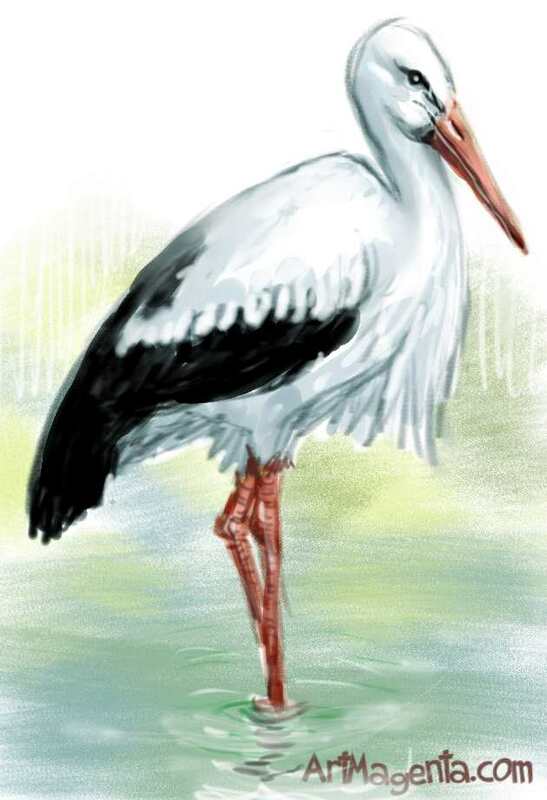 TAGS: Bird painting of White Stork, bird sketch of White Stork, bird drawing of White Stork, bird art of White Stork, bird illustration of White Stork. Black Stork (Ciconia nigra) occurs in eastern Europe and Asia. A few isolated populations in southwestern Spain and southern Africa. Most of the world population are migratory birds that overwinter in subtropical and tropical regions of Africa, India and Southeast Asia. The populations in Spain and South Africa are resident birds.